Charles Edgar Hunter born Ossining, Winchester Co., NY. Sarah H. Frisbie born Sing, Sing, New York of William Caleb Frisbie and Euphemia Sherwood. Charles E. Hunter marries in Hanover Co., VA, Sarah H. Frisbie. U. S. Census, Ossining, Westchester, NY, lists Charles E. Hunter, age 21, WM, Foundery man, owning no property, b. New York..; Sarah, age 21, Phebe, age 3/12; Eliza, age 10; George W., age 18, Foundry man., all born in NY. New York Census, Eastern Election District, Fourth Ward, of Albany in County of Albany, lists Charles E. Hunter, age 25, b. Weschester, NY; Moulder; lived in Albany one year; with wife Sarah, age 25 and 3 daughters Phoebe, Fanny and Ailda. U. S. Census, City of Albany, Albany Co., NY, lists Chas. E. Hunter, age 31, WM, Mouklder, $2,500.00 Real Estate, b. New York..; Sarah, age 31, Phebe E., age 10, Fanny, age 7; Aleda, age 5;, all born in NY. 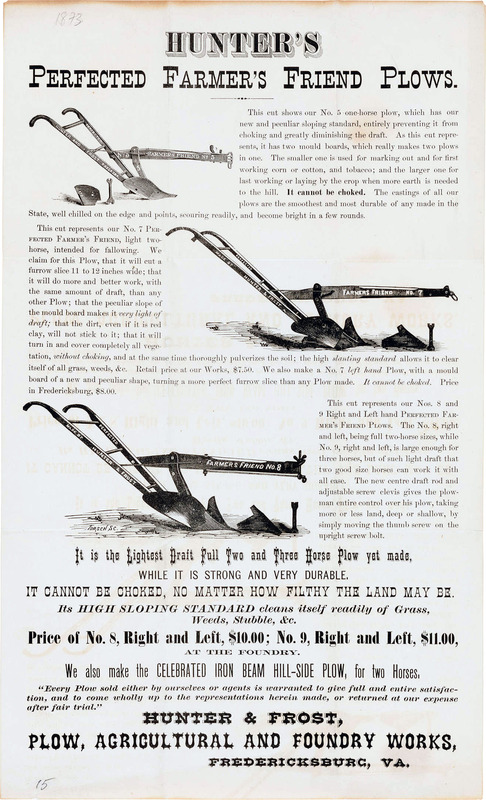 A broadside from 1873: Hunter's Perfected Farmer's Friend Plows. Click to see the full-sized image. U. S. Census Fredericksburg, VA, lists Charles. E. Hunter, age 41, WM, working as Iron Founder(ry), $5,000.00 Per. 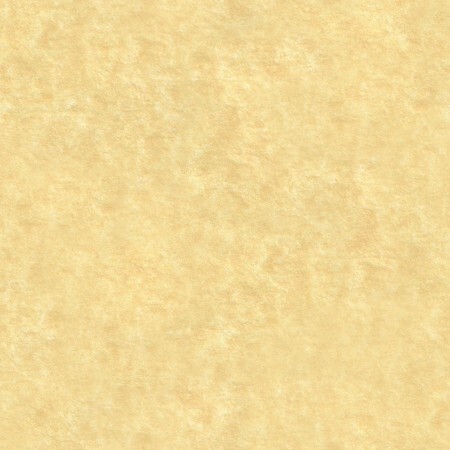 Estate, b. New York..; Sarah, age 41, Phebe E., age 20; Fannie, age 18; Alida, age 18; Chas. E., Jr, age 7; Geo. L. (b. PA), age 6; and Rodgers, John, age 2 (b. VA)., all born in NY except as noted. Hunter & Foster handbill advertisement. No. 5 One horse plow, No. 7 Perfected Farmer's Friend Plows, Nos. 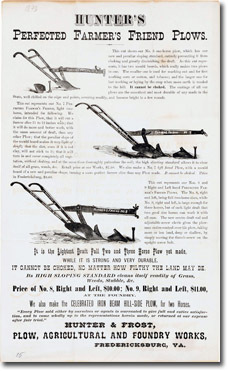 8 & 9 Right and Left handed Perfected Farmer's Friend Plows (see image above right). Plow Improvement Patent, No. 205,552, Charles E. Hunter of Fredericksburg, VA. Wit: L. C. Frost and W. L. Burrass. Charles E. Hunter died, Henrico Co., VA. Buried in Confederate Cemetery, Fredericksburg, VA. Click here to see Charles E. Hunter's grave at Findagrave.com. U. S. Census Fredericksburg, VA, lists Sarah Hunter, age 72, Head of Household, b. Jan 1829 in NY, widow, 7 children born, 4 living; living at 1011 Sophia (lists Caroline) St. Also in household is widowed daughter Phoebe and 3 children. Sarah H. Frisbie died, Fredericksburg, Virginia. Buried in Confederate Cemetery, Fredericksburg, VA. Click here to see Sarah Frisbie's grave at Findagrave.com.